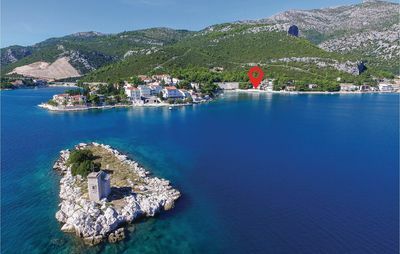 The apartment is located in the peaceful and small Rtina, only 20 kilometers north of Zadar towards the island of Pag. The inhabitants are special stol on the healing earth on the outskirts of the village. Mud packs are all recommended for people with rheumatic conditions and to its prevention. The apartment is located on the upper floor of a two story house and can accommodate eight persons. The upper floor is accessible only by stairs and has a floor space of 80sqm. It offers four bedrooms each with double beds (three of the beds are 160 x 200 cm, the fourth bed measures 180 x 200 cm). The two bathrooms are equipped with shower, sink, toilet and mirror cabinet. The floor has air conditioning, which is in the hallway, and fans in every room. The 20sqm large balcony offers a magnificent view of the bay overlooking the sunset. 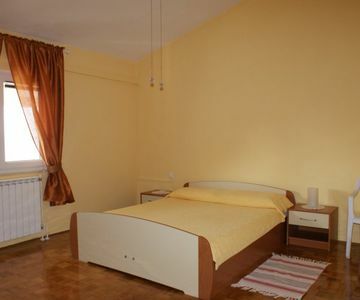 In addition there is a separate building with a floor space of 18sqm available. There is a fully equipped kitchen with stove, oven and fridge freezer, living room with satellite TV, table and chairs. The 30m2 large outdoor area off the kitchen has a dining table, BBQ and a sand-bowling. Four parking spaces are available. The mattresses are regularly cleaned and disinfected after each guest. The apartment is located only 200 meters from the beach and within walking distance from the nearest store. Fresh bread is served every day at the kiosk, which is located less than 100 meters away. The nearest inn is also just 300 meters away. Good restaurants with Dalmatian fish, seafood and lamb are only a few kilometers away.